Electric hedge trimmers are only as effective as their blades are sharp. Restore the original cutting power of the tool by taking the time to file down its now-dull cutting edges. Here's how. 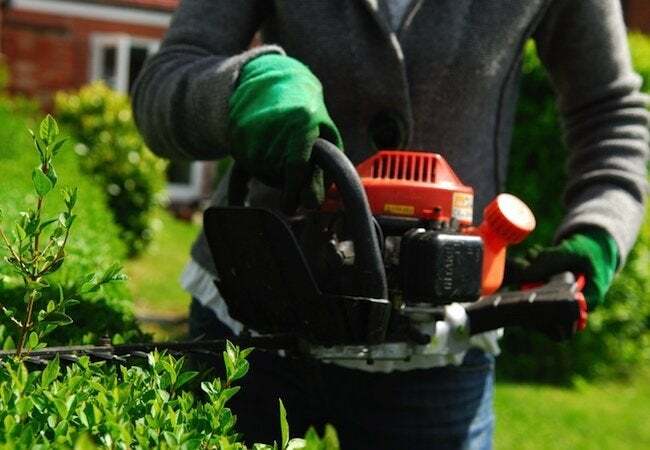 Powered hedge trimmers are a tremendous time-saver for any homeowner who prefers to handle his own landscaping. But if the blades of the tool aren’t sharp, the hedge trimmer tears and shreds foliage instead of cutting it cleanly. Follow these simple steps to sharpen hedge trimmers safely. First, don a pair of gloves and protective goggles. After you’ve removed the bolts that hold the two blades together, clamp each blade, one at a time, into a bench vice. Next, run a metal file down each cutting edge, being sure to keep the file at the same angle as the cutting edge. Push the file in one direction only—not back and forth—and continue until the cutting edge looks shiny. To test for sharpness, draw the edge of a sheet of paper against the cutting edges. If they’re really sharp, the blades should slice the paper. Before reassembling the too, lightly coat the blades with linseed oil to protect against corrosion and preserve their useful lifespan.